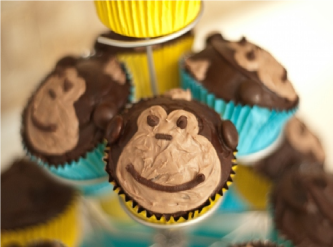 Monkey theme birthday party ideas for kids. 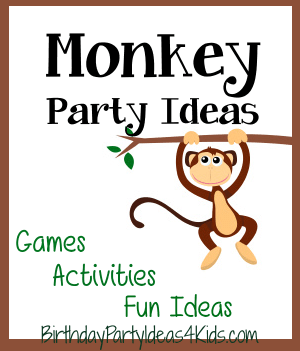 Ideas for monkey invitations, monkey decorations, monkey activities and games, monkey party favors and monkey goody bags. See our Sock Monkey party theme for more fun ideas! Purchase plastic bananas and write the party details on the banana with permanent marker. Cut banana shapes out of yellow construction paper or cardstock. Fold the paper in half and draw a banana on the front making sure that part of the banana touches the edge of where the paper is folded. Cut the banana leaving the fold attached. Spread glue on the front and sprinkle on glitter. Write party information on the inside. Make large monkey faces with construction or scrapbook paper and glue them on the front of blank cards. Decorate the party room like a jungle. Place banana's, coconuts and palm leaves on tables. Use 2 colors of green balloons and streamers. Make vines by twisting large sheets of green tissue paper together to make long, thin pieces. Tape the vines to walls, chairs, tables, etc. Cut strips of crepe paper into varying lengths 7 - 12". Tape them onto mantles, doorways, or tables side by side so they hang down. Paint monkey faces on each guest with face paint. Rent a bounce house for the little monkeys to use up their energy. For the10 things you need to know before renting a bounce house for the monkey party see our Bounce House Help page for great advice. Plan a trip to the zoo. Fun outdoor game for little monkeys! To begin have the party guests form a large circle around the birthday child. The birthday child is the "monkey". Give one of the children in the outer circle a small ball, plastic banana or a sock monkey. The children on the outer circle have to throw the object over the head of the "monkey" to someone on the opposite side of the circle. The "monkey" tries to catch the object as they are throwing it back and forth. When the "monkey" catches the object he/she then goes to the outer circle and the one who threw the object is the new "monkey". Monkey walk - Guests monkey walk as fast as they can to the cone and back. Banana on a Spoon - Give each team a wooden spoon and a banana. They must balance the banana on the spoon and walk the course. If the banana falls they must return to the start and begin again. Peel bananas - Guests are given a pile of bananas and one by one they must peel the bananas ... using only their feet! Monkey in a barrel - Using two barrels of Monkeys (one for each team) tell the guests they must hook together two monkeys and run the course - then the next person in line will run the course with three monkeys and so on. Make the relay races more challenging for older children by placing obstacles in their course such as crawling under ropes, going up and down a slide, jumping through hula hoops, climbing over the trampoline, etc. For an easy cupcake topper use a monkey from the Barrel Full of Monkeys game and place in the center of the cupcake.